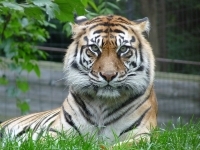 The Toronto Zoo is one of the largest zoos in the world, with more than six miles (10km) of walking trails spread over 700 acres. Over 5000 animals representing over 450 species call it home. Visitors will enjoy touring the zoo's seven geographic regions and encountering animals that are native to them. Favourites include hippos, lemurs, otters, gorillas, bears, Giant Pandas, snow leopards, lions, penguins and cheetahs. All told, award-winning exhibits await the entire family, as do many seasonal activities. The zoo's interactive wildlife experience is especially popular with kids.